Genetic research into diseases and conditions that predominantly affect children has always been particularly challenging. Traditionally, when high quality and high quantity DNA is required for a research project (e.g. greater than several micrograms), blood has typically been the only option. Blood draws are painful for children, dreaded by parents and disliked by technicians who must collect from the frightened child. It is also much more difficult to draw blood from children than from adults, due to the relative size of their veins and their willingness to stay in a fixed position. Unlike adults, children often don't have the ability to reason with their fears. But when a lot of DNA is required, there have not been many options. Readers of The Genetic Link know that Oragene for DNA from saliva is an ideal alternative to blood-based DNA collections but what if the target donor group is young children or infants or equally challenging, adults who are unable to spit? It has always been our goal to provide high quality, non-invasive, DNA and RNA collection products and we now have a new product to address the needs of those unable to provide a sample by delivering saliva directly into the kit. 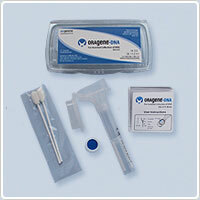 The Oragene (OG-575 or OGR-575) product offers a non-invasive, painless and convenient method to collect DNA from children and others who cannot spit. The simple collection protocol can be found on the product brochure. The saliva collected with the absorbent sponges is squeezed (or pressed) into the proprietary V-notch in the collection funnel and flows into the tube. This process is repeated until 0.75 ml of saliva is collected. Sample collection with the OG-575 will produce a median yield of 17.3ug of DNA. This format is standardized for automated processing, increases efficiency, minimizes sample handling and reduces handling errors. We’re very excited about this new product and the feedback we’ve received so far has been extremely positive. If you’d like to request a trial kit of the Oragene (OGR-5757 or OG-575) product, please click here. If you have any feedback on this product, you can leave a comment and let us know.